Online spending of US bargain hunters climbed above $1 billion by Thanksgiving evening, boding well for the holiday shopping season in the United States that is traditionally kicking off with today's Black Friday. According to Adobe Digital Index, US consumers spent $1.15 billion (1.08 billion euros) between midnight and 5pm Eastern Time on Thursday on online sales that were 14 percent higher than a year ago. "Online discounts are earlier and a lot bigger than last year," said Tamara Gaffney, principal research analyst at Adobe Digital Index. Online shopping on Thanksgiving has gained in popularity, with e-commerce retailers like Amazon, Alibaba and others offering cheap deals. "We saw one of our strongest days ever online," Brian Cornell, chief executive of discount retailer Target, told reporters on Thursday evening. He added that online sales grew by double digits, without giving further details. Traditionally the day after Thanksgiving, also known as Black Friday, has started the holiday shopping season in the United States with retailers offering steep discounts. "Black Friday is no longer a one-day event; it has turned into a multi-week event," Christopher Baldwin, chief executive officer at BJ's Wholesale Club, told the news agency Reuters. The National Retail Federation expects holiday sales to grow 3.6 percent this year to $655.8 billion. After the turkey comes the shopping spree, as Thanksgiving leads into the outrageous consumer holiday Black Friday. 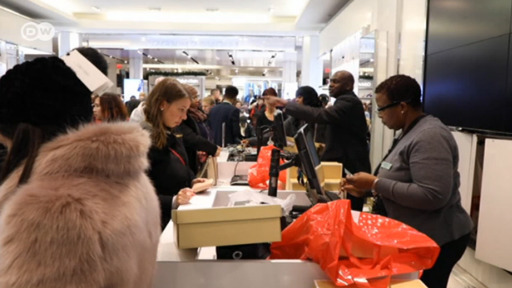 Thousands of shoppers are fighting over every store's special sales and for some of them the hunt is worth as much as the bargain.